This is the second article in a recurring column giving students an inside look at what’s happening in each College at WCU, enabling them to better develop their education plans, course selections, and career tracks. In today’s working world, a bachelor’s degree is no longer the standard. For many students, particularly those in the College of Health Sciences, the reality is most employers are looking for graduate degrees. And even when a profession doesn’t require a master’s degree, a student’s educational background and hands-on, real-world experiences need to stand out. 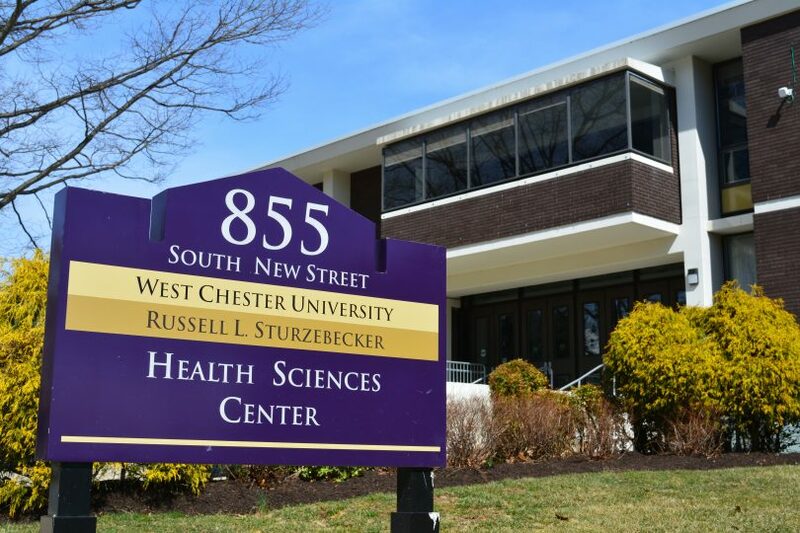 Fortunately, with accelerated programs, state-of-the-art patient simulation labs and community partnerships, West Chester University’s College of Health Sciences (CHS) is preparing students to enter professional careers by investing in pioneering programs and immersive learning experiences that will rival the educational opportunities available at other institutions in the mid-Atlantic region. As the need for students to have a master’s degree increases, the CHS is looking at how they can create pathways for students to be more successful and efficient in getting their undergraduate and master’s degrees. The CHS already offers an accelerated five-year program for nutrition students, in which fourth year students can take graduate courses at an undergraduate tuition rate. Dr. Heinerichs, Dean of the College of Health Sciences, revealed that a similar type of accelerated program is currently in the works for exercise science and public health students as well. In addition to new accelerated programs in the pipeline, the CHS is also set to introduce a new minor, hire a new health professor and two new nursing professors, as well as make changes to existing programs. The CHS is in the process of developing a sports medicine minor. The new minor would benefit students on pre-professional career tracks by allowing them to take coursework in rehabilitation, injury and evaluation of injury. The CHS also recently made new concentrations available for students majoring in nutrition, so that those with an interest in the field who don’t want to become registered dieticians have more options. While the CHS is investing in growing their programs and facilities internally, they are also dedicated to increasing their community outreach. For the second year, the CHS will partner with Chester County Futures, a local nonprofit organization. Chester County Futures works with local high schools to provide unserved students an eight week standardized curriculum to prepare them for college and give them the tools they need to be successful. This year, CHS students will be serving as mentors out of Coatesville High School. For the first four weeks of the program, CHS students will work alongside the organization’s members to teach goal-setting, communication, teamwork and an understanding of financial aid. During the second half of the program, Coatesville students will be brought onto campus and exposed to each of the College’s different disciplines through experiential and active learning exercises. Through this partnership, CHS students will acquire the experience of being a mentor, making a difference in the local community and promoting the programs they are involved in on campus. Scheduled to open in fall 2020, the new Sciences and Engineering Center will result in major transformations for the CHS. From bringing nursing students back on campus, to creating simulation labs that will benefit students from a vast array of departments, the new building will present many previously unachievable educational opportunities for students. “Our goal [with the new immersive learning space] is to have the capability to create actual patient exam rooms, in addition to the mannequins that we currently use to simulate blood pressure drops and internal organ injuries,” said Dr. Heinerichs. The CHS, in partnership with the theatre department, is piloting a new course that would utilize those spaces to create more hands-on learning opportunities for students in simulated environments. The new course called, “Patient Acting” will entail theatre students learning medical cases, how to portray symptoms and how to act like a patient, so that nursing students can practice patient evaluations. The program will also benefit students from other majors and departments, as they will learn a team approach to healthcare by having to communicate and collaborate with each other to provide diagnoses and treatments for patients. To learn more about how the program’s students in the College of Health Sciences study apply to the real world, the College is hosting its second Exercise is Medicine day on April 24. The day will consist of food, raffles and interactive and informative activities hosted by the different student groups in the CHS. Students, faculty and the general public are encouraged to come together and learn how to incorporate healthy living habits into their lives.